Sy Ellens visited the gallery last summer. He quietly asked if I would consider his work, paintings, for the gallery. When you are in the middle of your day, it is hard to be approached to consider an artist’s work. I try to be gracious because I know that for the artist, this request takes initiative. It makes their heart race. They are putting themselves out there. For any creative person, your work is personal, and asking to be considered, no matter how talented and how seasoned an artist, can be anxiety-ridden. I took Sy’s information and said that I would get back to him. Later that week, I looked at his website. I wanted to kick myself. I loved his work and felt that it would be great in our gallery. We made a plan to have him exhibit in 2016. A few weeks later, I realized that I hadn’t selected an ArtWalk artist for 2015 and an idea formulated. Sy agreed to enter our local competition and display several other paintings through the end of October. “Having grown up on a farm, I have developed a special relationship with the land. When I was a child, I picked stones, cultivated crops, pulled weeds, milked cows, and did many other chores. I helped with seed planting, pest-control, and harvesting. I learned what it is to go through a frustratingly dry season and patiently wait for rain or wait for the rain to stop. I know what it is like to have an abundant harvest and almost no harvest at all. This made life on the farm both interesting and difficult, challenging and unpredictable. And it is this special relationship which God has given me that I am trying to explore and creatively express in my paintings. From an aerial perspective, one can see how people divide the land and establish spaces for themselves which they call their own. One can also see how this little space then relates not only to the other many spaces, but also to the unpredictable natural areas of rivers and lakes. As this creates both challenges and opportunities in one’s daily life, so it does in the ordering of shapes, colors, and textures in my paintings. I often use several layers of paint in my landscapes. 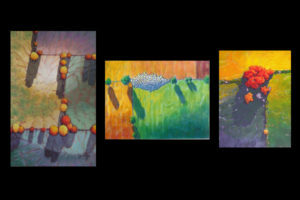 To me these layers represent the different crops as they are rotated from year to year. With all the experiences that I have had growing up, I have grown both intellectually and emotionally as well as spiritually. I also want to enrich the experiences of the viewers. I want to express a positive mood in my paintings through color: warm, fiery reds, yellows and oranges to brighten or inspire and hues of blue, green, and purple to calm or soothe. 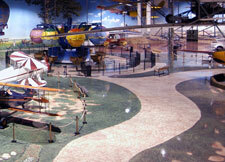 After traveling extensively by plane, I have been able to look at the earth from a distance. This gives me a new perspective of the land that I know so intimately. Everything looks peaceful and harmonious on the land. I wish that people could also live that way. Sy Ellens is a Michigan native who grew up on a farm. 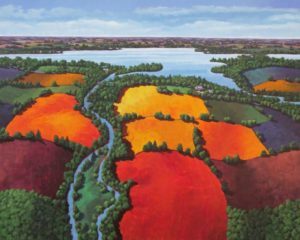 His love of the land is represented in most of his paintings. 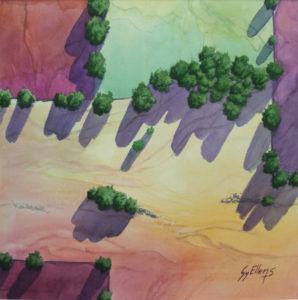 Our Fall show are several of his aerial paintings – acrylic, pastel, and oils. 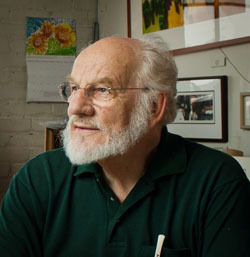 Sy was a teacher for many years in both Michigan and Nigeria. Since 1980, he has been a free-lance artist. 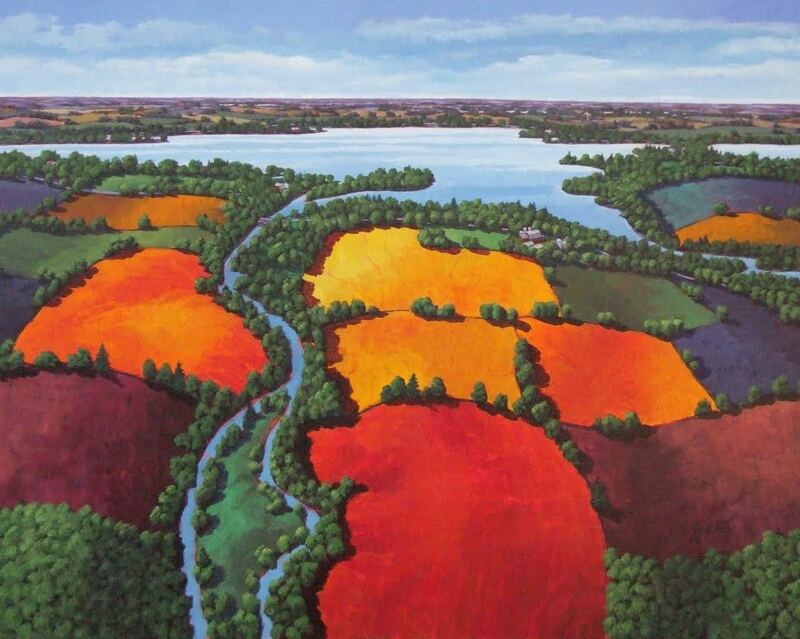 This painter has received many awards in international, national, and regional art competitions. Sy’s art is included in private and corporate collections in many US states, Canada, Nigeria, Netherlands, Germany, England, Switzerland, Italy, India, Poland, China, Hungary, Hong Kong, Japan, Spain. 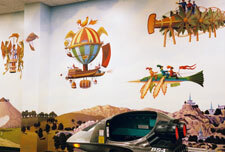 He has painted several murals including a 2200 square foot “Fantasy of Flight” mural in the Children’s Room and a 62,500 square foot floor mural in the new Kalamazoo Michigan Air Zoo.